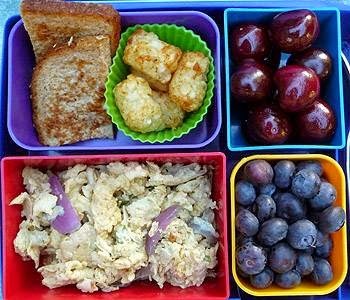 We are halfway through the school year and you may have gotten in a lunch-funk. 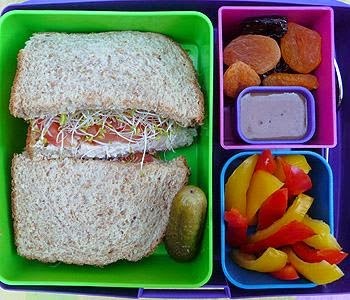 This time last year we posted some great lunch ideas from the makers of the Bento Box (Bento Lunch Ideas), and it's been one of our more popular posts! 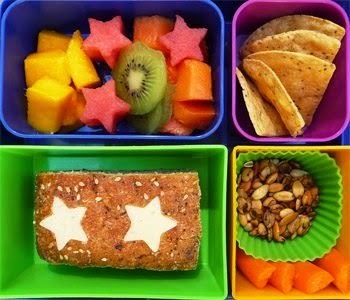 So I thought it was time to share another week's worth of lunch ideas for anyone who needs some fresh ideas for your child's school lunches. 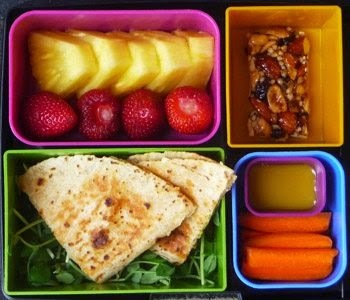 The lunches are packed into the Bento Lunchboxes which are a great way to pack a litter less lunch while keeping food separate while in one container, but you can of course pack them in any containers you currently use. To save some time, borrow some of these ideas for supper the night before and just make extras for lunch. Feel free to swap anything your little one wouldn't eat, with something they would! Put a slice of cheese through the middle of a piece of whole grain ciabatta bread and put into one of your large containers. Fill your large lidded container with sliced fresh fruit. We used kiwi, papaya, watermelon, and mango but feel free to your seasonal favorites. Fill one of your medium containers with whole grain tortilla chips. Fill your bento divider with tamari pumpkin seeds. Place the divider into your other medium container. Fill the rest of the container with carrot sticks. Make a tuna sandwich on whole wheat bread and store it in your extra large container along with your favorite kind of pickle. Fill one of your medium containers with strips of red and yellow bell peppers. Fill your other medium container with assorted dried fruit. Put balsamic vinaigrette into your dip container to dip your bell peppers into and store with your dried fruit. Prepare scrambled eggs. We added cheese and onions to ours. Let cool and put into one of your large containers. 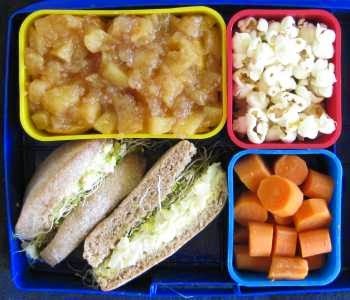 Put a few tater tots into one of your bento dividers to store in your other large container along with a sliced piece of whole wheat bread. Fill one of your medium containers with blueberries and the other with cherries. Prepare a quesadilla with your favorite ingredients. We used a whole-wheat and corn tortilla with pepper jack cheese and grilled veggies. Allow your quesadilla to cool and cut it in half. Serve it on a bed of pea shoots in your large un-lidded container. Remove the stems of some strawberries and line them up in one half of your large lidded container. Husk, core and cube your pineapple. Arrange the pieces alongside your strawberries in the large lidded container. Pour your favorite dressing into the small dip container. We chose honey mustard dressing, which goes great with both veggies and fruit. Place the small dip container in your medium lidded container. Include a handful of baby carrots next to the dip container in the medium lidded container. Finally, include your favorite fruit and nut bar in the medium lidded container. Peel and dice the apples and boil in a small amount of water. Add cinnamon and cook until tender and the liquid has been absorbed. Slice the whole wheat English muffin and use it to prepare an egg salad sandwich with sprouts. Peel and cut the carrots and steam in a small amount of water.